Let's take a look into a vendor big data technology today. 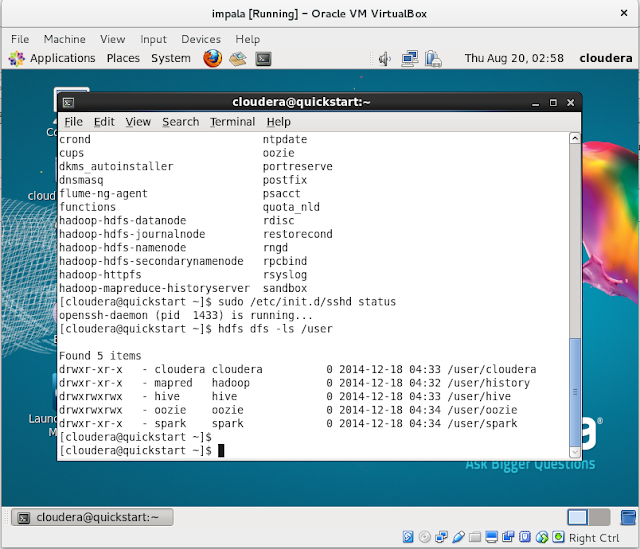 In this article, we will take a look into Cloudera Impala. So what is Impala all about? Cloudera Impala is Cloudera's open source massively parallel processing (MPP) SQL query engine for data stored in a computer cluster running Apache Hadoop. Lightning-fast, distributed SQL queries for petabytes of data stored in Apache Hadoop clusters. Let us download a virtual machine image, this is good as impala works with integration with hadoop and if you don't have hadoop knowledge, you must start from establish hadoop cluster first before integrating it with Impala. 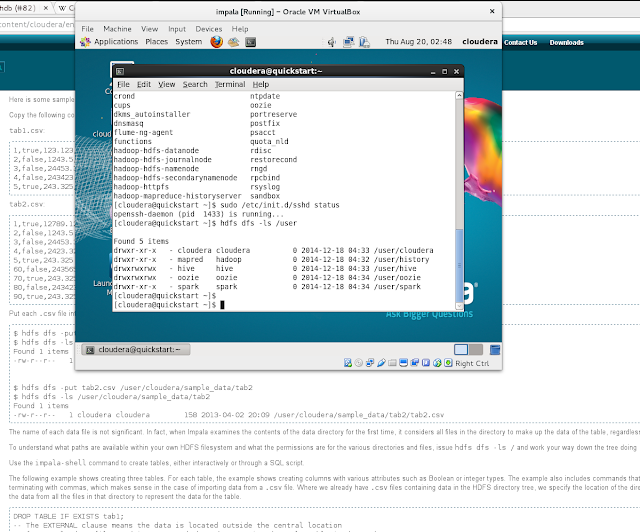 With this virtual machine image, it is as easy as import this virtual machine image into the host and power it up. It also save time for you like setting it up and reduce error. With that said, I'm downloading a virtual box image. Once download and extract to a directory. 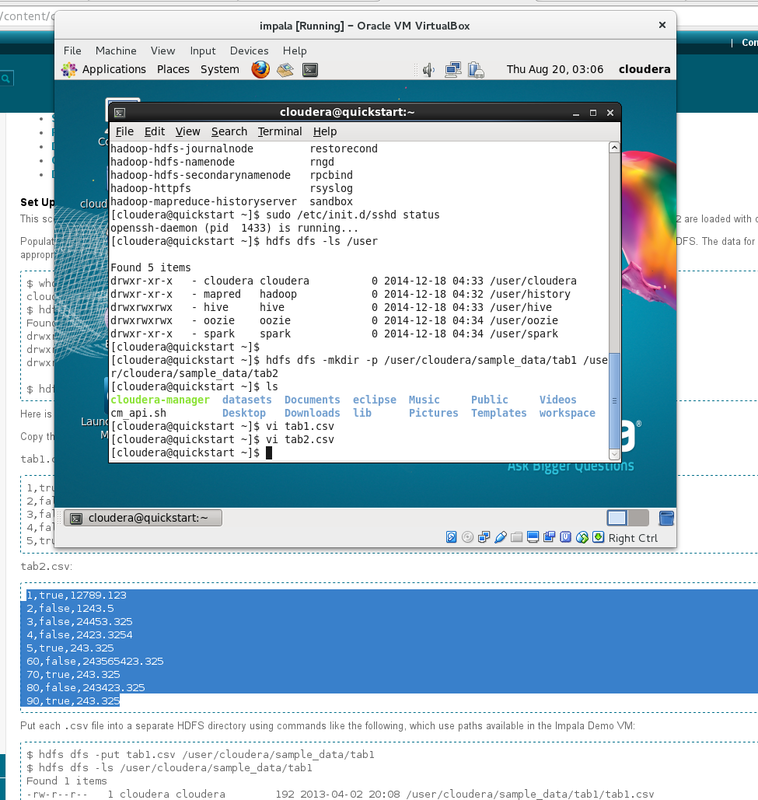 If you have not install virtualbox, you should by now install it. apt-get install virtualbox virtualbox-guest-additions-iso and make sure virtualbox instance is running. Aug 20 17:07:43 localhost systemd: Started LSB: VirtualBox Linux kernel module. Aug 20 17:07:43 localhost virtualbox: Starting VirtualBox kernel modules. 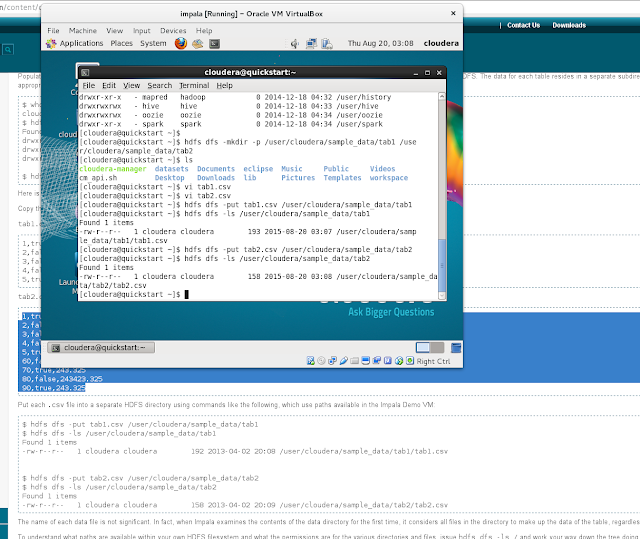 launch virtualbox and add that virtual image into a new instance, see screenshot below. now power this virtual machine up! Please be patient as it will take a long time to boot it up. At least for my pc. Be patient and you might want to get some drink in the mean time. The ongoing article is using this tutorial. 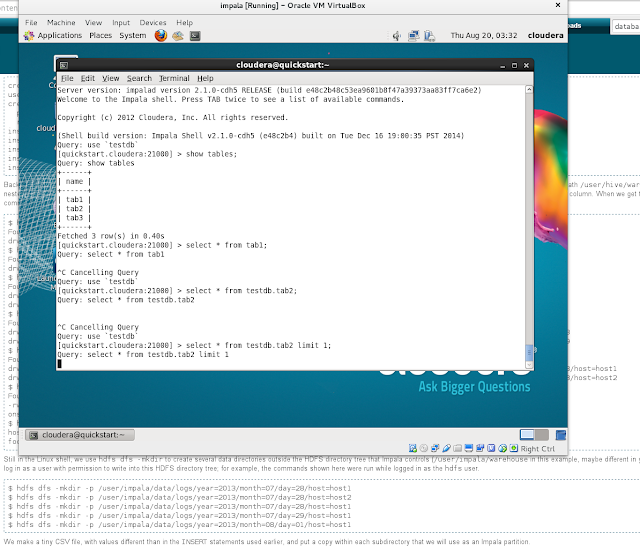 However, I give up as select statement take a long time and it is very slow in virtual environment, at least for me here. But I will illustrate until the point where it became slow. first you need to copy this csv files (tab1.csv and tab2.csv) into the virtual machine. Then you can load the script with the sql to create the tables and load the csv into the table. But the example given in the tutorial does not have database and i suggest you add these two lines into the script and load it up. After that, you can issue command impala-shell and you can do sql queries, but as you see, the select statement just hang there forever. Today, we will take another look at another big data technology. Apache HBase is the topic for today and before we dip our toe into Apache HBase, let's find out what actually is Apache HBase. Apache HBase  is an open-source, distributed, versioned, column-oriented store modeled after Google' Bigtable: A Distributed Storage System for Structured Data by Chang et al. Just as Bigtable leverages the distributed data storage provided by the Google File System, HBase provides Bigtable-like capabilities on top of Apache Hadoop . In this article, we can setup a single node for this adventure. Before we begin, let's download a copy of Apache HBase here. Once downloaded, extract the compressed content. At the time of this writing, I'm using Apache HBase version 1.1.1 for this learning experience. If you cannot change system configuration for this java, then in the HBase configuration file, conf/hbase-env.sh, uncomment JAVA_HOME variable and set to the java that you installed. The main configuration file for hbase is conf/hbase-site.xml and we will now edit this file so it became such as following. Change to your environment as required. 2015-08-18 17:49:41,533 INFO SecurityLogger.org.apache.hadoop.hbase.Server: Connection from 127.0.1.1 port: 36745 with version info: version: "1.1.1" url: "git://hw11397.local/Volumes/hbase-1.1.1RC0/hbase" revision: "d0a115a7267f54e01c72c603ec53e91ec418292f" user: "ndimiduk" date: "Tue Jun 23 14:44:07 PDT 2015" src_checksum: "6e2d8cecbd28738ad86daacb25dc467e"
2015-08-18 17:49:46,812 INFO SecurityLogger.org.apache.hadoop.hbase.Server: Connection from 127.0.0.1 port: 53042 with version info: version: "1.1.1" url: "git://hw11397.local/Volumes/hbase-1.1.1RC0/hbase" revision: "d0a115a7267f54e01c72c603ec53e91ec418292f" user: "ndimiduk" date: "Tue Jun 23 14:44:07 PDT 2015" src_checksum: "6e2d8cecbd28738ad86daacb25dc467e"
2015-08-18 17:49:48,309 INFO SecurityLogger.org.apache.hadoop.hbase.Server: Connection from 127.0.0.1 port: 53043 with version info: version: "1.1.1" url: "git://hw11397.local/Volumes/hbase-1.1.1RC0/hbase" revision: "d0a115a7267f54e01c72c603ec53e91ec418292f" user: "ndimiduk" date: "Tue Jun 23 14:44:07 PDT 2015" src_checksum: "6e2d8cecbd28738ad86daacb25dc467e"
2015-08-18 17:49:49,317 INFO SecurityLogger.org.apache.hadoop.hbase.Server: Connection from 127.0.0.1 port: 53044 with version info: version: "1.1.1" url: "git://hw11397.local/Volumes/hbase-1.1.1RC0/hbase" revision: "d0a115a7267f54e01c72c603ec53e91ec418292f" user: "ndimiduk" date: "Tue Jun 23 14:44:07 PDT 2015" src_checksum: "6e2d8cecbd28738ad86daacb25dc467e"
2015-08-18 17:49:49,303 INFO [PostOpenDeployTasks:78a2a3664205fcf679d2043ac3259648] regionserver.HRegionServer: Post open deploy tasks for hbase:namespace,,1439891388424.78a2a3664205fcf679d2043ac3259648. and you notice, log file is also available and jps shown a HMaster is running. okay, let's experience apache hbase using a hbase shell. A help command show very helpful description such as the followings. command parameters. Type <RETURN> after entering a command to run it. list information about a table. let's put something into the table we have just created. Here, we insert three values, one at a time. The first insert is at row1, column cf:a, with a value of value1. Columns in HBase are comprised of a column family prefix, cf in this example, followed by a colon and then a column qualifier suffix, a in this case. To select the row from the table, use scan. To get a row only. Something really interesting about apache hbase, say if you want to delete or change settings of a table, you need to disable it first. After that, you can enable it back. okay, now, let's delete this table. ERROR: Table test is enabled. Disable it first. Okay, we are done for this basic learning. Let's quit for now. If you like me who came from apache cassandra, apache hbase looks very similar. If this interest you, I shall leave you with the following three links which will get you further. Storm is a distributed realtime computation system. 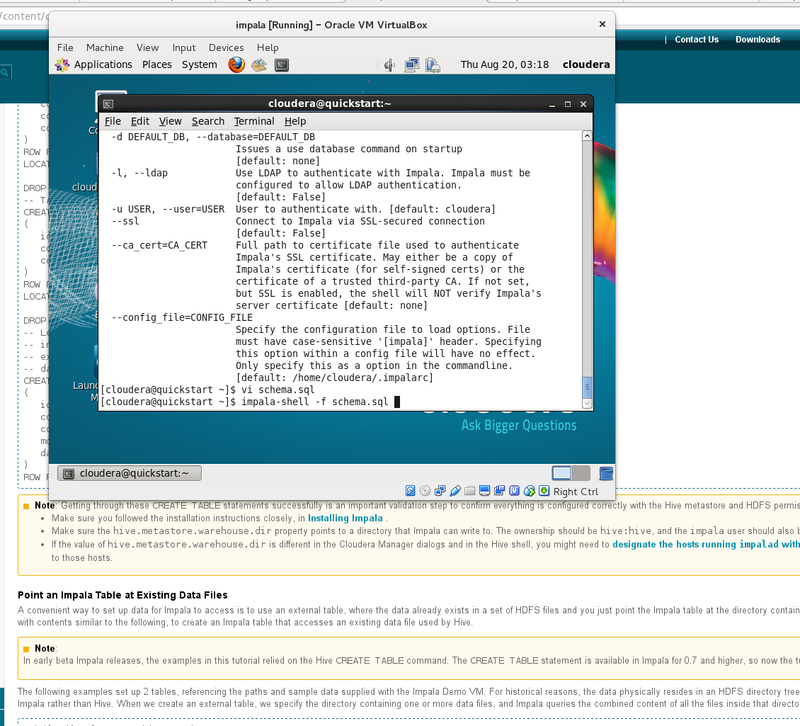 Similar to how Hadoop provides a set of general primitives for doing batch processing, Storm provides a set of general primitives for doing realtime computation. Well, if you like me which are new to Apache Storm, this seem a bit vague on what Apache Storm is about. Fear not, we will in this article, go through some basic apache storm like installing storm, setup a storm cluster and perform a storm of hello world. But this is a good video that give introduction to apache storm. If you study storm, the fundamentals three terminologies which you may come across which are spouts, bolts and topologies. These definition are excerpt from this site link. Let's first download and install Apache Storm. Pick a stable version at here, download and then extract it. By now, your directories should be similar to the one below. I'm using Apache Storm 0.9.5 for this learning experience. In the next article, we will setup a storm cluster. It is difficult to jump start into software development if you are new to introduction of many sub technologies. Today, I'm gonna put aside of my project and start to learn another technology. Gradle, a build system but there are much more than just build. If you are also new to gradle, you might want to find out what actually is gradle. Gradle is a build automation tool that builds upon the concepts of Apache Ant and Apache Maven and introduces a Groovy-based domain-specific language (DSL) instead of the more traditional XML form of declaring the project configuration. Gradle uses a directed acyclic graph ("DAG") to determine the order in which tasks can be run. If you have many projects that depend on a project, gradle will solve your problems. We will look into the basic of gradle build automation tool today. I love to code java and so I will use java as this demo. First, let's install gradle. If you are using deb based distribution like debian or ubuntu, to install gradle, it is as easy as $ sudo apt-get install gradle. Otherwise, you can download gradle from http://gradle.org/ and install in your system. Now let's create a gradle build file. See below. drwxr-xr-x 214 user user 28K Aug 6 17:15 ..
drwxr-xr-x  2 user user 4.0K Aug 6 17:15 .
drwxr-xr-x  4 user user 4.0K Aug 6 17:15 .
one liner of input produce so many output files. Amazing! Why so many files that were generated, read the output of the command output, it compile, process resource, jar, assemble, test check and build. What are all these means, I will not explain to you one by one, you learn better if you read this definition yourself which is documented very well here. You might say, hey , I have different java source path can gradle handle this? Yes of cause! In the build path you created, you can add another line. Most of us coming from java has ant build file. If that is the case, gradle integrate nicely with ant too, you just need to import ant build file and then call ant target from gradle. See code snippet below. // import ant build file. [ant:echo] hello this is ant. That looks pretty good! If you curious about what gradle parameter that you can use during figuring out if the build went wrong, you should really read into this link. Also, if read on the environment variable as you can specify other jdk for gradle or even java parameter during compile big projects. You might want to ask also, what if I only want to compile, I don't want to go through all the automatic builds above. No problem, since this is a java project, you specify compileJava. As you can see, gradle is very flexible and because of that, you might want to exploit it further. For example, customizing the task in build.gradle, listing projects, listing tasks and others. For that, read here as it explain and give a lot of example how all that can be done. So at this stage, you might want to add more feature into gradle build file. Okay, let's do just that. // default src test resources. // dependencies of external jar, we reference the very good from maven. Now, if you want to generate eclipse configuration, just run gradle eclipse, all eclipse configuration and setting are created automatically. Of cause, you can customize settings even further. Now, I create a simple unit test class file, see below. Then only run a single unit test, that's very cool. There are two additional directories created , that is nativeapp and webapp, this is subprojects for this big project and it contain its own gradle build file. At the parent of the gradle build file, we see a subprojects configuration as this will applied to all the subprojects. You can create a settings.gradle to specify the subprojects. That's all for today, as this is just an introduction to quicklyl dive into some of the cool features of gradle, with this shown, I hope it give you some idea where to head next. Good luck! Okay, let's install Node.js. 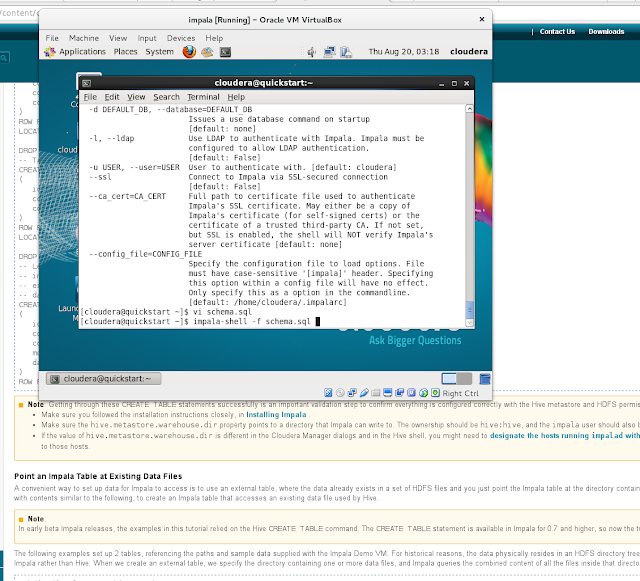 If you are using deb base linux distribution, for example debian or ubuntu. It is as easy as $ sudo apt-get install nodejs. Otherwise, you can download a copy from this official site and install it. Let's start with a simple Node.js hello world. Very easy, create a helloworld.js and do the print. See below. very simple, one liner produce the hello world output. You might ask, what can Node.js functionalities can I use other than console. Well, at the end of this article, I will give you the link so you can explore further. But in the meantime, I will show you how easy to create a web server using Node.js! Let's read the code below. As you can read, we create a file called server.js require a module called http. We pass an anonymous function into the function createServer of http module. The response will return http status 200 with a hello world. You can try to access in your browser with localhost:8888. Notice that the execution of the Node.js continue after http is created, unlike other language which will wait the execution finish before proceed the next line of code, Node.js execution will continue and this make Node.js asynchronous. Well, by now you should understand what Node.js can do for you and if you interest more on Node.js , I will leave you this very helpful link. 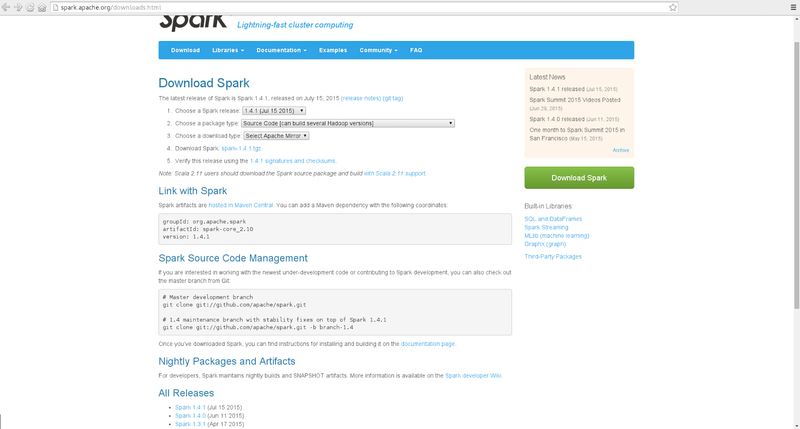 Spark is a fast and general cluster computing system for Big Data. It provides high-level APIs in Scala, Java, and Python, and an optimized engine that supports general computation graphs for data analysis. It also supports a rich set of higher-level tools including Spark SQL for SQL and DataFrames, MLlib for machine learning, GraphX for graph processing, and Spark Streaming for stream processing. Okay, let's download a copy of spark to your local pc. You can download from this site. extract the downloaded file and ran the command, not good. Failed to find Spark assembly in /home/user/Desktop/spark-1.4.1/assembly/target/scala-2.10. You need to build Spark before running this program. Well, the default download setting is source, so you will have to compile the source. okay, let's beef up a little for the build setting, and the build took very long time, eventually. I switch to build in the directory build. See below. Yes, finally the build is success. Even though success, as you can see above, it took 41minutes on my pc just to compile. Okay, now that all libs are built, let's repeat the command we type just now. 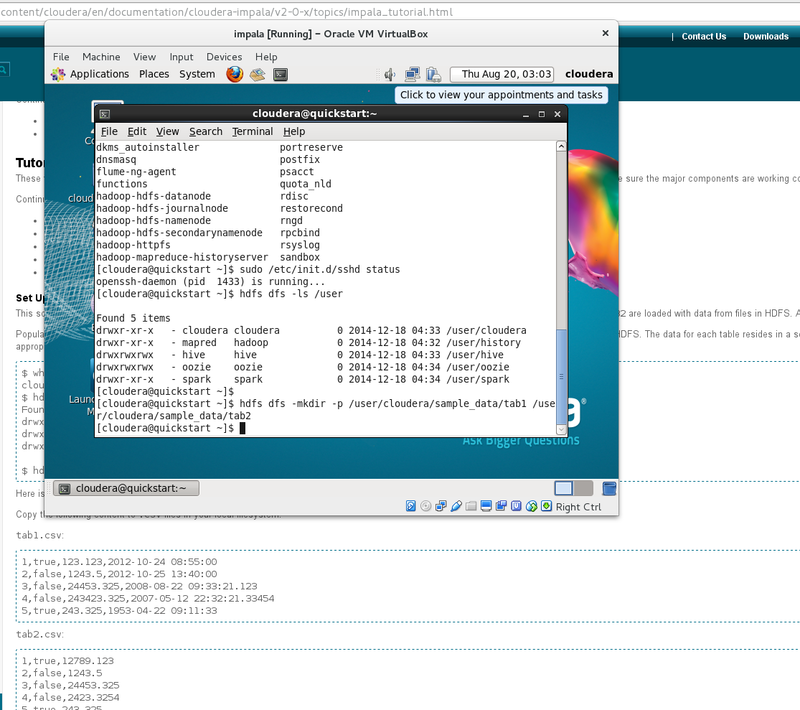 15/08/04 20:21:17 INFO Utils: Successfully started service 'HTTP class server' on port 56379. 15/08/04 20:21:26 INFO Utils: Successfully started service 'sparkDriver' on port 47888. 15/08/04 20:21:27 INFO Utils: Successfully started service 'HTTP file server' on port 50089. 15/08/04 20:21:28 INFO Utils: Successfully started service 'SparkUI' on port 4040. 15/08/04 20:21:28 INFO Utils: Successfully started service 'org.apache.spark.network.netty.NettyBlockTransferService' on port 36428. 15/08/04 20:21:29 INFO SparkILoop: Created spark context..
15/08/04 20:21:30 INFO SparkILoop: Created sql context.. Okay, everything looks good, the error above no longer exists. Let's explore further. That's pretty nice, for a small demo on how is spark work. Now move on to the next example, let's open another terminal. 15/08/04 20:37:46 INFO Utils: Successfully started service 'sparkDriver' on port 35904. 15/08/04 20:37:47 INFO Utils: Successfully started service 'HTTP file server' on port 45429. 15/08/04 20:37:49 WARN Utils: Service 'SparkUI' could not bind on port 4040. Attempting port 4041. 15/08/04 20:37:50 INFO Utils: Successfully started service 'SparkUI' on port 4041. 15/08/04 20:37:51 INFO Utils: Successfully started service 'org.apache.spark.network.netty.NettyBlockTransferService' on port 47045. SparkContext available as sc, SQLContext available as sqlContext. Looks good, next example will calculate pi using spark. 15/08/04 20:44:53 INFO Utils: Successfully started service 'sparkDriver' on port 45817. 15/08/04 20:44:53 INFO Utils: Successfully started service 'HTTP file server' on port 50955. 15/08/04 20:44:54 INFO Utils: Successfully started service 'SparkUI' on port 4040. 15/08/04 20:44:58 INFO Utils: Successfully started service 'org.apache.spark.network.netty.NettyBlockTransferService' on port 45731. 15/08/04 20:45:03 INFO MapOutputTrackerMasterEndpoint: MapOutputTrackerMasterEndpoint stopped! 15/08/04 20:45:03 INFO Utils: path = /tmp/spark-da217260-adb6-474e-9908-9dcdd39371e9/blockmgr-5ed813af-a26f-413c-bdfc-1e08001f9cb2, already present as root for deletion. 15/08/04 20:45:03 INFO OutputCommitCoordinator$OutputCommitCoordinatorEndpoint: OutputCommitCoordinator stopped! 15/08/04 20:45:03 INFO RemoteActorRefProvider$RemotingTerminator: Shutting down remote daemon. 15/08/04 20:45:03 INFO RemoteActorRefProvider$RemotingTerminator: Remote daemon shut down; proceeding with flushing remote transports. With this introduction, it give you an idea on what spark is all about, you can basically use spark to do distributed processing. These tutorial give some quick idea on what spark is all about and how I can use it. It is definitely worth while to look into the example directory to see what can spark really do for you. Before I end this, I think these two links are very helpful to get you further. A while back, I was reading an article talk about code coverage and I googled, there is this opensource code coverage tool called cobertura. So naturally I thought to give it a try and the result was not disappoint. Read on to find out why. You might wondering why the name of cobertura, from the official site explanation. "Cobertura" is the Spanish and Portuguese word for "coverage." We were trying to avoid acronyms and coffee references. It's not too hard to associate the word "cobertura" with the word "coverage," and it even has a bit of a zesty kick to it! Okay, again, why would I want this as I have already junit running? 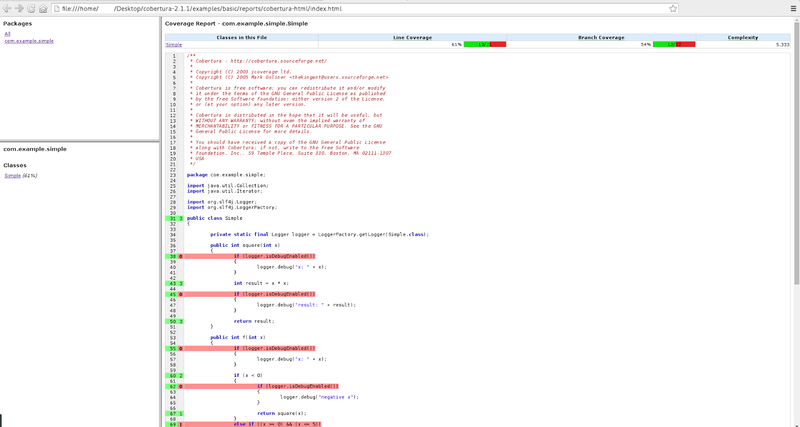 So cobertura is a auxiliary to the exiting test by showing how much of your test currently cover in your main codebase. 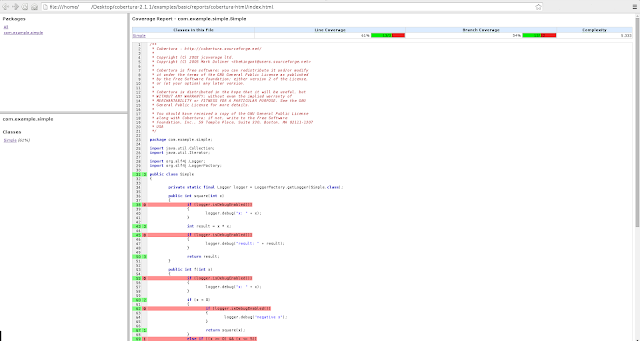 So a requirement is such that, you need to have tests written before you use cobertura. Okay, enough for the theory, let's dip toe into water. First, download the library, you can download from this link. Next, unzip this file and change into this library directory. There is a nice ready example for you to play with. change into this directory and run the command such as below. Yes, you will need ant installed and java. Copyright (C) 2003 jcoverage ltd.
clean   Remove all files created by the build/test process. coverage Compile, instrument ourself, run the tests and generate JUnit and coverage reports. So that's pretty clear, we have two targets, the clean and coverage. The coverage will generate all necessary files for you. See below. [javac] Note: /home/user/Desktop/cobertura-2.1.1/examples/basic/src/com/example/simple/SimpleTest.java uses unchecked or unsafe operations. [cobertura-instrument] 21:55:08,567 |-WARN in ch.qos.logback.classic.LoggerContext[default] - Resource [logback.xml] occurs multiple times on the classpath. [cobertura-instrument] 21:55:08,898 |-INFO in ch.qos.logback.classic.joran.action.ConfigurationAction - End of configuration. [cobertura-instrument] 21:55:09,218 |-WARN in ch.qos.logback.classic.LoggerContext[default] - Resource [logback.xml] occurs multiple times on the classpath. [cobertura-instrument] 21:55:09,403 |-INFO in ch.qos.logback.classic.joran.action.ConfigurationAction - End of configuration. [cobertura-instrument] [INFO] Cobertura: Saved information on 1 classes. [junit] [INFO] Cobertura: Loaded information on 1 classes. [junit] [INFO] Cobertura: Saved information on 1 classes. [cobertura-report] 21:55:13,535 |-WARN in ch.qos.logback.classic.LoggerContext[default] - Resource [logback.xml] occurs multiple times on the classpath. [cobertura-report] 21:55:13,749 |-INFO in ch.qos.logback.classic.joran.action.ConfigurationAction - End of configuration. [cobertura-report] [INFO] Cobertura: Loaded information on 1 classes. [cobertura-report] 21:55:14,131 |-WARN in ch.qos.logback.classic.LoggerContext[default] - Resource [logback.xml] occurs multiple times on the classpath. [cobertura-report] 21:55:14,336 |-INFO in ch.qos.logback.classic.joran.action.ConfigurationAction - End of configuration. [cobertura-report] 21:55:14,695 |-WARN in ch.qos.logback.classic.LoggerContext[default] - Resource [logback.xml] occurs multiple times on the classpath. [cobertura-report] 21:55:14,935 |-INFO in ch.qos.logback.classic.joran.action.ConfigurationAction - End of configuration. From the output, we see a target called instrument and then test was called. Then all the reports are generated. If you list the directory now, you should see a few additional files are added. cobertura.ser, reports, classes and instrumented. All the generated reports are in the reports directory. The one is relevant for this article cobertura and I will show you cobertura-html report. That's it, if you want to go further integrating into this code coverage tool into your project, start to look into the example build.xml. Have fun.